Amatrol’s Programmable Logic Controller (PLC) Process Control Learning System – Siemens S7-1200 (99-PCS712) expands on Amatrol’s broad offering of process control skills and knowledge by connecting the Portable PLC Learning System (990-PS712) to the Level and Flow Process Control Learning System (T5552). This connection allows the 990-PS712 to operate the T5552 via PLC so that learners can practice real-world, PLC-based open and closed loop process control methods. This learning system is vital for anyone currently working in or interested in careers fields involving pharmaceutical plants, refineries, chemical manufacturing facilities, and many more. The 99-PCS712 includes an analog cable set, a discrete cable set, multimedia curriculum, a student reference guide, and a supplemental disk. Learners will use these components and materials to study discrete and analog inputs for open loop control, closed loop control, closed loop performance, closed loop tuning, Siemens S7-1200 PID instruction, and much more! The 99-PCS712 connects the Portable Programmable Logic Controller’s (990-PS712) inputs and outputs to the Level and Flow Process Control Learning System (T5552), which allows the PLC program to receive data from the T5552’s sensors. This system allows learners to expand their real-world process control skills after they’ve mastered the topics offered by the T5552 and the 990-PS712. With a focus on hands-on PLC skills that replicate actual industrial applications in process control, this learning system is a commitment by Amatrol to expand the spectrum of real-world topics to better prepare learners for available careers in pharmaceutical production, fuel refinement, and chemical manufacturing. In addition to the interactive multimedia, the 99-PCS712 also features a strong offering of hands-on skills to develop a learner’s confidence and competence when working on real-world systems. These skills feature step-by-step explanations of what is being accomplished and why each step is important towards the fulfillment of the process. This depth is built-in to prevent cookbook like instructions where the learner merely follows along without comprehending why they’re doing it. This learning system includes skills such as entering a routine that provides closed loop level control, modifying a routine to provide open loop control of a 3-way proportional valve, and tuning a PLC-based closed loop process control system. In addition to the Siemens, Amatrol also offers a PLC-controlled process control system for Allen-Bradley’s ControlLogix 5300 PLC that is featured on with Amatrol’s Portable Programmable Logic Controller Learning System (990-PAB53A). This alternative further expands Amatrol’s offering for training to build real-world PLC process control skills. Study Real-World PLC Applications on a Process Control System! The 99-PCS712’s curriculum focuses on PLC-controlled level and flow applications in open loop and closed loop systems. As an example of the curriculum’s depth, learners will study closed loop control, performance, and tuning. Some of the 99-PCS712’s major topics include the operation of a PLC-based closed loop process control system, the function of PID tag structure, and how to tune a Siemens S7-1200 PLC-based closed loop process control system. This curriculum is presented within a stunning, highly interactive multimedia format that allows learners to explore the presented topics through text, audio narration, 3D animation, video, and interactive quizzes and games. 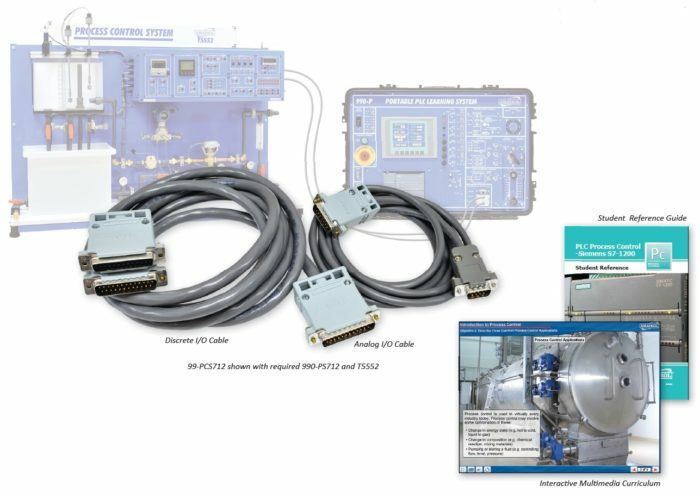 A sample copy of the PLC Process Control – Siemens S7-1200 Student Reference Guide is also included with the system for your evaluation. Sourced from the system’s multimedia curriculum, the Student Reference Guide takes the entire series’ technical content contained in the learning objectives and combines them into one perfect-bound book. Student Reference Guides supplement this course by providing a condensed, inexpensive reference tool that learners will find invaluable once they finish their training making it the perfect course takeaway. Vital for anyone currently working in or interested in careers fields involving pharmaceutical plants, refineries, chemical manufacturing facilities, etc. Study discrete and analog inputs for open loop control, closed loop control, closed loop performance, closed loop tuning, Siemens S7-1200 PID instruction, and much more!